Welcome to Creature Feature Starjammer! Today we present the Neverwere, individuals who have been infected with a contagious alternate reality. This feral man unhinges in darkness, multiple views of him shifting in and out of view, his true position uncertain. The material planes are infinite, filled with variety and variation. For every version of the material plane that could exist, one does exist, different and unrecognizable through changes great and small. One of the greatest potential changes is when a mortal makes a different decision than one of their counterparts in the other materials. It is possible to travel from one material to another through the plane of shadows, to which all things connect. Travelers between these realities sometimes manage to integrate into their new planes, or at the very least avoid obvious notice. Others are not as fortunate. 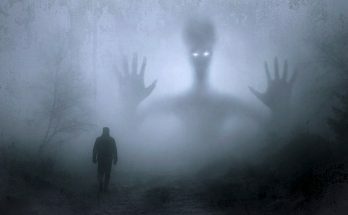 In areas of great darkness and shadow influence, usually in the umbras of massive stellar bodies, or in the parts of space where the light goes to die, an incursion can occur. Without the certainty of lights guidance, the planes can shift and bleed together, and creatures and even reality itself can bleed across the planar barriers. Those exposed to such an event can become infected, becoming a neverwere… a version of themselves that never should have existed in this realm. These neverweres have been replaced entirely with another version of themselves, from another plane of existence where something was different. Not only is the original person gone, replaced by someone alien, but the neverwere suffers as well, suddenly forced into a reality that they don’t recognize. While the neverwere intruder might try and consciously resist it, their very being attempts to correct this oversight, seeking to convert others to its own strain of reality. Whenever a neverwere spreads its contamination, the newly converted creatures are brought in from their own reality, the more the plane is converted to the one they came from the more at home they feel. Individual neverweres can often resist this pull, but it becomes stronger in the dark. Without the sun’s guidance and observation, the neverweres become unphased, no longer as firmly connected to any reality and instead under the influence of the plane of shadows. These individuals cannot help but spread their reality infection to any creature not tied to their version of reality, even attempting to attack and convert other neverweres from different versions of the material. It is possible that should any given material plane get overwhelmed with a specific neverwere infestation, the plane itself would shift, transforming entirely into a copy of the other plane of existence. If this has already occurred no record has been found. “Neverwere” is an acquired template that can be added to any corporeal creature with memories. Special Abilities A neverwere creature gains the following special abilities. All neverweres have two forms, their base form, and their phasing form. A neverwere can assume their phasing form as a full-round action with a DC 15 Constitution check, or their base form with a DC 20 Constitution check. When in areas of darkness the neverwere gets a +5 bonus to assume their phasing form and a -5 penalty to assume their base form. The neverwere may shift automatically during periods of uncertainty and doubt. Any creature reduced to 0 Wisdom by a neverwere transforms into a neverwere of the same strain in 24 hours. Before the transformation is complete, the infected can be cured by casting remove curse in an area protected by dimensional anchor. After the transformation is completed, the individual can be restored to their prior form only through wish, miracle, or the intervention of a deity or similar power. While in their phasing form the neverwere constantly shifts between different planes and realities as if under the effects of the blink spell. They are treated as undead with light vulnerability for abilities which affect such creatures differently but are not otherwise treated as undead. While in phasing form, all of the creature’s natural attacks and unarmed strikes also inflict 1 Wisdom damage bleed. A neverwere in their phasing form has a touch attack they can use once per round as a natural weapon. The touch is treated as a primary natural weapon that replaces one claw or slam attack if the creature has any. If wielding weapons, the neverwere can use the touch attack as a secondary natural weapon. The neverwere’s touch attack deals 1d8 points of damage +1 for every 2 Hit Dice possessed by the neverwere. The touch attack also inflicts a single point of Wisdom damage bleed. A neverwere in their phasing form have the see in darkness special ability, allowing them to see in darkness of any kind, including that created by deeper darkness. Neverweres gain darkvision 60 feet in their base form. If their base form already has darkvision, its range is extended by 60 feet.